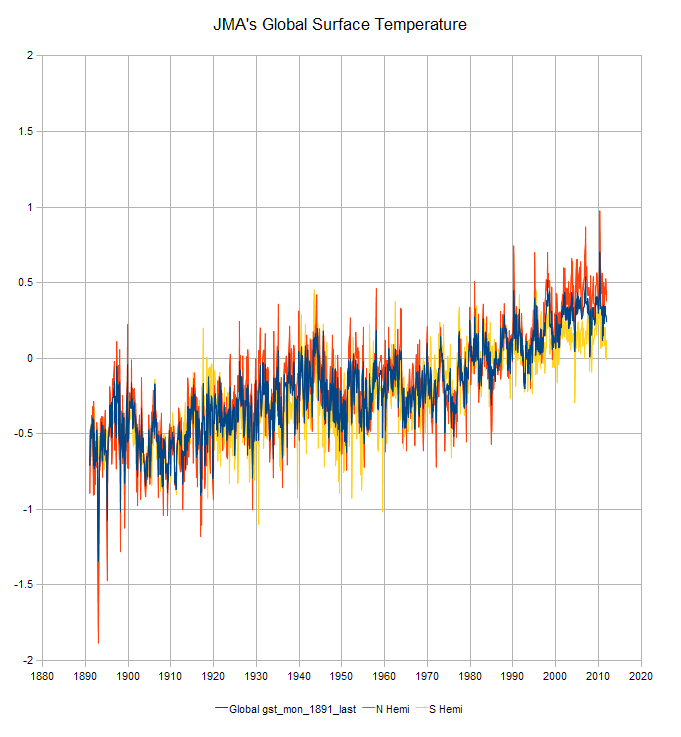 Anthony Watts has posted an article at WUWT about an ensemble of global temperature time series being shown by NASA. This has a twist, there is a new kid on the block it seems Anthony didn’t know about, neither did I. Apparently they use their own GHCN/SST variant but switch from GHCN to CLIMAT data in recent years. I’ve mentioned CLIMAT to do with the UK surface stations project. Ask if you need to know more from me. Inside the gridded data looked similar to some UK Met Office files, at least in layout, if very different in other respects. As it turned out it was quite easy to use the hadcrut configuration and subroutine as a template. Figured the field width and to my surprise the years started scrolling as it built the database, then committed. Size looked sane. So I ran compute global and hemisphere means, worked first time. Only floor is I think, longitude is reversed, need to flip a flip flag. Check that later. Means are computed from a linear grid as a cosine() weighted mean, with missing data handled straightforwardly. I do no fancy stats stuff, is a straight work used here for all gridded. In the case of RSS and UAH produces a clone. Here is my compute of global mean and hemisphere means. On plot overlays the official annual well enough, slight increase on claimed straight line trend, 0.71 vs. 0.68, of no significance. Looks like their plot has recomputed the reference period, so zero doesn’t match, your problem. Data runs from January 1891 through December 2011. Presumably they update rarely. Tab delimited text file inside zip archive is here. This is unofficial version. That cooler southern hemisphere looks a little worrying. I was enjoying global warming while it lasted. Having no gridded data software I was wondering how I was going to plot time series from the JMA data, and Hey Presto! Here’s what I need. What a fine fellow you are, Tim. Anthony Watts claims that the two series disagree, but the only significant disagreement I can see is in the SH around 1950. Am I missing something? Great (and speedy) work Tim! Thanks much! Anthony is showing a plot by NASA which has JMA noticeably colder after 2000 or so. Must be the rocket science. I’ve done nothing other than omit cells marked as missing data and omit latitude empty of data, taking into account the necessary math. I hope it isn’t me. Is hot off the press, output code though is old. Only thing I noticed when I overlaid the JMA annual data plot was a disagreement about zero. Might be an idea to double check, see what happens if you overlay their plot. 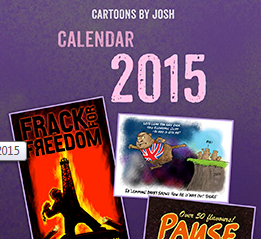 I assume JMA will add 2012 quite soon. If anyone spots they have done this let me know so I can update. Nothing wrong with your data, Tim. The selection of the baseline years is probably what does it. I can replicate the difference between JMA and HadCRUT shown on the Watts graph by plotting both series relative to the HadCRUT 1961-1990 baseline, although the difference after 2000 is only about 0.1C, hardly enough to worry about. The difference lies in 2000-2001. The rise is much less in JMA , apparently Reudy is working with an older version of the japanese data than that which Tim got here. It seems they have now ‘got their mind right’. Their post 2000 has now been adjusted to show the same continued rise that the other datasets show. Yet more politically corrected data. Tim, Could you easily add the satellite data for a 1979-2013 zoom in? here’s a quick comparison of UAH, RSS and HADsst2 wit the air temps appropriately scaled to allow for different heat capacity. Bob: Thanks for your analysis of JMA COBE SST. As you say nothing too exceptional. Which indicates to me there are issues with the land based data. Most likely to do with removal of higher altitude stations from the network. Could do something, don’t think it is worth it. I think the interest there is a compare of land CLIMAT with TLT, which would need extraction of land grid cells. Given the data is recent only, is not in Kelvin, the up and down for a compare is free flying. Bob Tisdale: Thanks for the link you provided to the JMA SST data in your post. Do you have a link to the JMA air temperature data too? I agree that there isn’t any fundamental difference between JMA and the other series. The question, however, is whether “combined land-ocean” series that average air temperatures measured five feet or so above the surface on land with SSTs measured anywhere between a few inches and fifty feet below the surface of the ocean mean anything, particularly when the two often show quite different trends. I contend they don’t. Roger A: Bob states that the SST is available as a time series, whereas the air temp data needs gridding as Tim has done. Whatever happened to all the versions of the 1930s values, they were always shown as much higher before the 2000 and later modifications? I’ll bet the difference is in the Arctic data they don’t interpolate the way NASA does. The 5C increases claimed over (say) 16% of the planet have a big mathematical impact where the rest is 0.6C. I downloaded both annual and monthly gridded data from http://ds.data.jma.go.jp/tcc/tcc/products/gwp/temp/map/download.html on 5 Feb. It has been updated to Dec 2012. I have formed a global annual mean series by area-weighting each grid box (by cos(87.5, 82.5,…2.5, -2.5,…, -87.5) degrees) and then averaging over all grid boxes with data in each month, and then forming annual means, which is what their method description seems to specify. Omitting the intermediate monthly global temperature step makes no difference. My results are not identical to the graph at http://ds.data.jma.go.jp/tcc/tcc/products/gwp/temp/ann_wld.html. Most of the flattening since 2000 shown in Reudy’s plot is evident, although the 1996 spike is smaller. And linear OLS regression over 1891-2012 gives a slope of 0.551 K/ century, not 0.68 K/ century as per the JMA graph (and 0.71 K/ century reported by Tim Channon in the above post). Working instead from JMA’s gridded annual data, the trend I get is 0.58 K/ century, and post-2000 temperatures reach as high as in 1998 – mainly because 1998 shows a much smaller spike. I have tried averaging over longitudes before latitudes (giving a full weight to each latitude band that has any grid box data) and also averaging separately over NH and SH and then taking the mean. Neither variant made a significant difference. I wonder if JMA revised their data on adding 2012 in? 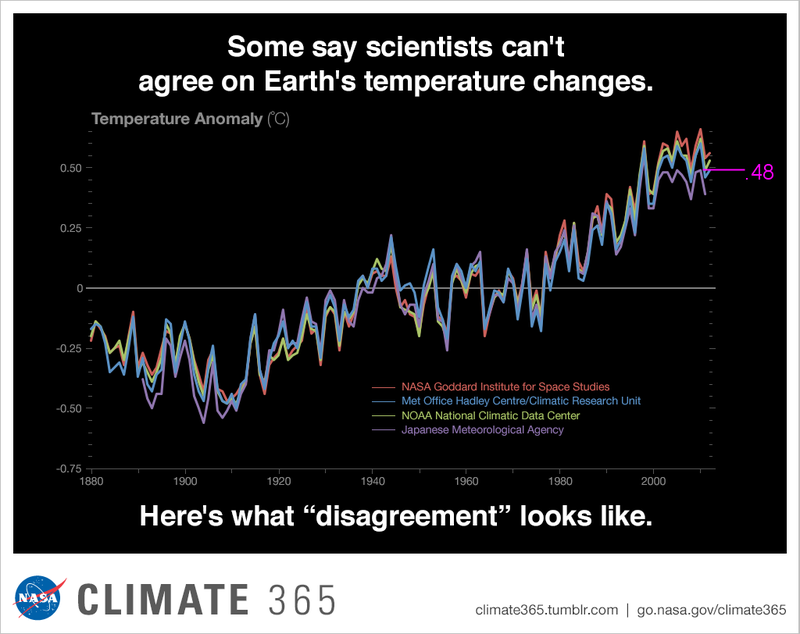 But I would still have expected their graph – which has a data point for 2012 – to agree to the gridded data. Has anyone else found the same as me? Does it match the time series I have attached to the article, which I computed from the monthly gridded? And yes goodie, they have updated, I’ll grab it later on. Just seen your post, but I had already spotted that I had forgotten to divide by the sum of the weights in use and fixed the omission. I now get a graph that looks identical to the JMA one, and a trend of 0.684 K/century – or 0.681 excluding 2012, as per JMA. My monthly global time series does however not match yours. Their regression R^2 is 0.9425. There is no obvious pattern in the differences. Difference old/new is zero, they have only added a dozen months. I hazard a guess the difference is in handling missing data but I can’t remember the details of what I did.